We have all heard the old adage “don’t sweat the small stuff”. When it comes to catching fish, catching bass in a tournament situation in particular, I could not disagree more with that saying. At every level, tournament bass fishing is highly competitive. The average tournament field often includes anglers with varying degrees of talents and skillsets. The amount of financial resources also varies greatly among tournament anglers. Over the years, when measuring myself against the field I am usually very competitive, but do not always finish as close to the top of the leaderboard as I would like. Honestly, I sometimes lack the “knack”, natural instinct to catch bass as good as some others do. Therefore, I am always on the lookout for ways improve, work a little harder, and close the talent-gap between me and the best in the field on any given day. It is part of what drives me as a bass fisherman. What can I do to get one or two more bites? What can I do to catch one extra “kicker” fish? What can I do to maximize every minute on the water? Like most anglers on the tournament trail, my budget has its limits. When searching for answers to the questions posed above, price/cost is a factor. Simply purchasing the latest and greatest technology to replace what I have currently is usually not an option for me to sharpen the learning curve. However, cost is not an excuse. For me, “sweating the small stuff” is a way to close the gap between me and the stiffest competition on tournament day without stretching my budget beyond its limits. What do I mean by that? I mean attention to detail. And, I mean controlling the controllable. These ideas overlap and go hand-in-hand. When I think of attention to detail, several things come to mind immediately. These components are the foundation for successful bass fishing. Often, they are taken for granted and overlooked. However, one or more of them will remind an angler of their importance at a crucial moment on the water when a tournament win is on the line. Anglers spend too much time worrying about fish catching factors that are out of their control. Weather, water conditions, and other competitors are prime examples of things that cannot be controlled. So, control the controllable. Spend your time where it makes the most difference; use your time to effect positive change to increase the quantity and quality of the bites you get during a day on the water. The following are aspects of fishing that an angler can control, where an attention to detail will make a positive difference. Line: Constantly monitor your line for cuts, abrasions, and other signs of wear. Keep your line treated with one of the many conditioners on the market to enhance its performance and extend its life. Store spools of line at a constant temperature to prevention breakdown and decay. Knots: Learn a couple of knots that you have confidence in and that fit your fishing style. Do not worry about learning every knot that someone claims to be the best. Learn to tie them quickly and efficiently. When on the water, check the condition of your knots regularly. Retie often. Do not procrastinate, choosing to wait a few more casts before cutting and retying. Hooks: Monitor all hooks for sharpness as often as you can. Keep a hook sharpener handy to quickly repair a dulled hook point. If a hook bends, even slightly, replace it instead of straightening it. Straightening hooks weakens them, leading to hook failure. Choose the correct hook size for the soft plastic, crankbait, or topwater bait you are fishing. A hook that is too small decreases hookup and landing percentage. A hook that is too big impedes the action of the bait which entices fewer strikes. Rod and Reel Pairings: This one sounds easy, right, but it is often overlooked. Match the length, power, and action of each rod as best you can to each reel. For example, a Texas rig, buzzbait, and a few other things can often be fished effectively on the same rod. Therefore, match that rod with a higher gear ratio reel, one with a wider spool if possible, so that pitches can be quiet and precise while casts can be long and smooth. In both instances, being able to pick up line quickly is critical. In contrast, a large capacity, slower speed reel with a big handle is the choice for most any cranking rod. Bombing casts and grinding the bottom are accomplished most effectively with this type of reel. Incorrectly matched rods and reels are an inconvenience at best. At their worst, missed hooksets and lost fish are the result. Customizing, Rigging and Trimming: Many of today’s baits can be fished with great success right out of the package, much more so as compared to a couple of decades ago. However, properly rigging a bait for maximum attractiveness and performance is a cost-free way to get more bites. When attaching a soft plastic swimbait to a screw-lock hook, rig it as straight as possible. It is well worth the extra few seconds! 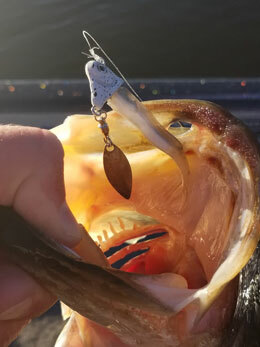 When tying on a crankbait, make sure the knot does not end up in the break of the split ring. If it does, cut it and retie it! Applying a quality scent to a soft plastic or a skirted bait might produce an extra bite or two. If not, it will cause a bass to hold onto your bait for a second longer which increases hookup percentage. Paint a “false eye” on the side of your crankbaits to give an attacking bass a bullseye to hone in on. Pay attention to the thickness and shape of your skirted baits. Trim skirts to look more lifelike. Fish bulkier skirts in dingier water to help bass locate your bait. Thin your skirted bait in clearer water so that it is slightly less visible to bass who are keen sight feeders in a clearwater environment. Organization: In my opinion, it is almost impossible to be too organized. Being organized costs nothing! Hours spent in preparation on the night before a tournament is time well spent. Do not wait until you arrive at the launch site to make sure you have everything you need for tournament day. If you do, frustration and regret will be the result. Starting a tournament day on the wrong foot puts you two steps behind the stiffest competition. Also, be organized in the boat. Have the supplies that you will need on that particular day close at hand. Instead of searching for something you need and falling behind, you will be making more presentations to the bass and increase your chances of dropping a “dirty 30” on the scales at weigh-in time. Bass fishing and tournament preparation can be as tedious as you wish to make it. I acknowledge that anglers must guard against detail overload. However, controlling the controllable and an attention to detail are cost-effective ways to close the gap between you and the best in the field on tournament day. In addition to being cost-effective, “sweating the small stuff” WILL produce more bites and put more “big ones” in the boat. Until next time, God Bless, good fishing, and tight lines to all.